Since 1996, we have been a family-owned Albuquerque window and door company. Our mission is to always offer the highest quality windows and doors for Albuquerque, Santa Fe, Grants, and surrounding areas… at prices everyone can afford. We pride ourselves in always being the market leader, offering all the latest technologies and products. We are a Retractable Screen dealer. We offer screens for in or out swing doors, for sliding doors, entry doors, exterior, sunshade systems & retractable window screens. All systems are Powder coated and include a Limited Lifetime Warranty. Over 35 colors and 6 wood grains. We focus on the product quality and design. Mirage Retractable Screens have the longest trouble free life available, because it is built to last. Born of a need, inspired by an artifact, crafted by hand. We build custom doors, gates and furniture — by hand — using reclaimed wood and architectural antiques from around the world. Our use of antique and reclaimed material is what distinquishes our products from all others. We showcase the world's largest collection of antique doors, including Spanish Colonial and classic antique mesquite Mexican doors, teak and pine doors from Southeast Asia as well as material from Central and South America, and Northern New Mexico. Among the thousands of antique doors, you will also find salvaged building materials - ornate carved columns and corbels, antique carved cabinets, dowry chests, reclaimed beams and ceiling timbers, antique ceiling tins and roofing material, cast iron railings and wooden boats all from the 18th through the early 20th centuries. La Puerta Originals is a family owned and operated company located in Santa Fe, New Mexico. We ship throughout the country and even internationally. Let us build and an original for you! 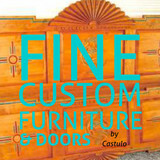 Hello, I am Castulo Gallegos, owner of Fine Custom Furniture and Doors. I bring to you over 25 years of experience building quality furniture and doors. I became a carpenter when I was very young and learned fine woodworking techniques from old world masters in Mexico. In those days, the entire process of woodworking and carving was done by hand with hand tools, giving each piece orginality and character. Over the years I have learned to build and design many different styles of furniture. Our furniture is built in New Mexico with quality kiln dried wood, mortise and tenon joinery. Each piece is a hand crafted, hand tooled work of art that is durable and built to last. We give your furniture that special touch and care that will be treasured for years to come. Casa Di Ferro is an established New Mexico business with an Old World Connection. Owner, Andrew Bongiorno is a fourth generation Italian born artisan. He continues a tradition taught to him by his grandfather in Sicily. His skill and craftsmanship have earned him high recognition for his wrought-iron furnishings and architectural accessories. Andrew is a stickler on Quality and continually impresses on his employees the importance of Quality Workmanship and customer satisfaction. Adobe door company specializes in custom residential and commercial southwestern style doors. In business in Albuquerque since 1993. Our doors are hand crafted in a southwestern design using traditional and modern wood working techniques that have been proven durable by time, from a variety of woods: Knotty Pine, Clear Pine, Alder, Oak, Mahogany, Fir, Pecan, Ash, Cedar, Wormy & Clear Maple and numerous others. We have a large selection of rustic hardware in a variety of finishes to match your design requirements. Owner Max Turcios can help you custom design doors and gates from the simplest to the most extravagant. We also offer a variety of surface finishes: smooth sanded, wire brushed, light distress, heavy distressed and hand carved patterns to meet any styling taste. Artisans of the Desert was founded in 1981 by Chris Sandoval, an accomplished fine furniture designer and wood craftsman. His unique style is rooted in traditional designs yet infused with a modern design sensibility. Chris was initiated into woodworking as a child by his father George, who gave him the task of sweeping sawdust when Chris was about six years old. A few years later Chris learned about sanding and staining, and at age 11 he learned the basics of woodcarving. Through his teens Chris continued to work with his father and gained a solid foundation in the craft of making traditional Spanish Colonial furniture. After completing college with a degree in music, Chris returned to furniture making, spending two years as an apprentice to Albuquerque contemporary furniture maker Frederico Armijo. Working with modern designs and new techniques was a source of inspiration for Chris, who began fusing elements of contemporary and traditional designs into his own distinct style. By 1981, he was ready to start his own studio and Artisans of the Desert was born. Since starting his furniture business, Chris has focused on high-quality commissioned pieces for individual clients as well as businesses, churches and cultural centers. He has also continued to design and build his own handmade wood furniture, which has received numerous awards and other recognition at shows nationwide. As Artisans of the Desert approaches the 30-year mark, Chris remains the primary craftsman in the workshop, creating and building his own original designs as well as commissioned work. He manages a staff of approximately 5 woodworkers who help in the building process. Your Best Door Company! Locally owned and operated overhead garage door and opener service company. At PureColor we are committed to making the world a better place by developing clean technologies and creating healthier living environments. Our eco-friendly products are high-performance, stylish and safe. Unlike conventional technologies that sacrifice health for performance, PureColor products deliver both through our patent-pending system. Professional installation of household doors & cabinets and garage & closet organizers. From an early age I developed exceptional skill in model making, pencil drawing, oil and acrylic painting and proportion. I received special privileges in High School art classes and was granted permission to paint a wall mural in the Grants High School lobby in 1977. They liked it enough to leave it there for thirty two years. I was commissioned to paint a building sized mural in 1985 which received the “Beautiful Albuquerque Award” in 1986. The mural entitled “Spring Cottonwoods” is at 610 Gold today after 28 years. I was introduced to woodworking in 1987 and my future became clear. I learned door and furniture making from the craftsmen of Santa Fe and Taos, New Mexico, and opened my own studio in 1990. In the years since, I have acquired a love for modern and old world styles. I learned to create the classic “Santa Fe Style” as well as my modern WovenWoods doors. Put my talents to work for you and commission me to make something you have in mind and remember……. Nothing beats a great entry door! Whether it's upgrading or repairing an existing storefront, manual or automatic door, or perhaps redesigning a new energy efficient, affordable and aesthetically pleasing entrance for your business; we offer a turn-key solution. Protect your investment by using only licensed New Mexico contractors. 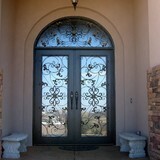 We are the best door experts in New Mexico! Santa Fe Door Store Inc.
manufacturer of custom wood doors and millwork. Both residential and commercial. What kind of services do Los Ranchos de Albuquerque door dealers provide? Door dealers are responsible for a variety of services, including door installation, replacement, door repair and custom door design. If you need a new door, Los Ranchos de Albuquerque, NM door dealers will help you determine what kind you need, as well as shape, color, size and more. From barn doors to French doors to front doors, these professionals can help you choose, install and maintain your door investments. Wood doors are beautiful, versatile and tend to be the most popular choice for both interior and exterior doors; they are easy to custom build, and include oak, cherry, walnut, mahogany, maple, fir and pine. Some standard wood doors have MDF cores wrapped in wood veneers, which minimizes the chances of warping as real wood expands when wet and contracts when dry. If your heart is set on a wood door but you think the Los Ranchos de Albuquerque, NM climate might cause it to warp, talk to your door professional about a furniture-grade veneered door. Aluminum doors have an insulated core and come in a variety of colors and finishes. With a baked-on enamel finish, they won’t rust or need repainting, and many come with a 20-year warranty. Next to wood they are the most expensive and have to be custom-made. A Los Ranchos de Albuquerque, NM door dealer can help you find a reputable aluminum door manufacturer. Find door dealers and installers in Los Ranchos de Albuquerque, NM on Houzz. Look in the Professionals section of our website and search for Los Ranchos de Albuquerque, NM door dealers and installers. Read reviews, look at project photos and see how a pro can help with your home improvement project.